Cycle vital de la grenouille - Dictionnaire Visuel - Copyright © 2005-2016 - Tous droits réservés. 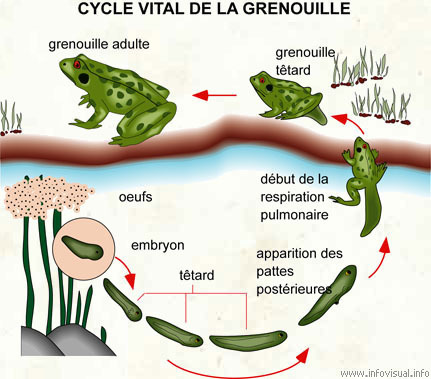 [img]https://infovisual.info//storage/app/media/02/img_fr/029 Cycle vital grenouille.jpg[/img] [url=https://infovisual.info/fr][/url] - [url=http://www.infovisual.info/]Dictionnaire Visuel[/url] - Copyright © 2005-2016 - Tous droits réservés. Cycle vital de la grenouille: amphibien, vivant près des lacs et étangs, pourvu de palmes aux pattes postérieures. Se déplace en nageant et en sautant. Grenouille adulte: grenouille ayant atteint la maturité. Grenouille têtard: stade du cycle vital de la grenouille durant lequel elle n'est ni têtard, ni grenouille adulte. Début de la respiration pulmonaire: commencement de la respiration par les poumons. Apparition des pattes postérieures: début du développement des membres arrières. Têtard: larve de la grenouille. Embryon: grenouille étant encore dans l'oeuf. Oeuf: cellule résultant de la fécondation de l'ovule et qui contient l'embryon de la grenouille. Poison dart frog (also dart frog, poison frog or formerly poison arrow frog) is the common name of a group of frogs in the family Dendrobatidae which are native to Central and South America. These amphibians are often called "dart frogs" due to indigenous Amerindians' use of their toxic secretions to poison the tips of blowdarts. In fact, of over 175 species, only three have been documented as being used for this purpose (curare plants are more commonly used), and none come from the Dendrobates genus, which is most characterized by the brilliant color and complex patterns of its members. Although all dendrobatids are at least somewhat toxic in the wild, levels of toxicity vary considerably from one species to the next, and from one population to another. Most species of poison dart frogs are small, sometimes less than 1.5 centimetres (0.59 in) in adult length, although a few are up to 6 centimetres (2.4 in) in length. Most poison dart frogs are brightly colored, displaying aposematic patterns to warn potential predators. Unlike most other frogs, they are active during the day, rather than being primarily nocturnal. They lay their eggs in moist places, including on leaves, in plants, among exposed roots, and elsewhere, and allow the tadpoles to wriggle onto their backs shortly after they hatch. They then carry the tadpoles to water, where they remain until metamorphosis. The water is typically a pool, but some species use the water gathered in bromeliads or other plants; and some species provide food, supplying the tadpoles with unfertilized eggs to eat. Poison dart frogs are endemic to humid, tropical environments of Central and South America. These frogs are generally found in tropical rainforests, including in Bolivia, Costa Rica, Brazil, Ecuador, Venezuela, Suriname, French Guyana, Peru, Panama, Nicaragua and non-native to Hawaii. Dendrobatids tend to live on or close to the ground, as well as in trees as much as 20 feet (6.1 m) from the ground. Colors are probably under polygenic control, while the actual patterns are probably controlled by a single locus. Therefore, species such as Dendrobates tinctorius can include color pattern morphs that can be interbred. Differing coloration has historically misidentified single species as separate, and there is still controversy among taxonomists over classification. For example, Dendrobates azureus has been classified as D. tinctorius "Azureus" (much like a plant variety), making it a morph of D. tinctorius. Many poison dart frogs secrete lipophilic alkaloid toxins through their skin. As a result, they are able to be active alongside potential predators during the day. Dart frogs also do not synthesize their poisons, but sequester the chemicals from prey items, such as ants and mites. Because of this, captive-bred animals do not contain significant levels of toxins. Most wild species are not lethal to their predators, but rather taste foul enough that frogs are released immediately. Despite the potent poisons utilized by some poison dart frogs, there are some predators that have developed the ability to withstand the toxins, including the Amazon ground snake (Liophis epinephelus). A chemical extracted from the skin of Epipedobates tricolor is of medicinal value. A painkiller 200-times as potent as morphine, called epibatidine, has little or no negative side effects. Secretions from dendrobatids are also showing promise as muscle relaxants, heart stimulants and appetite suppressants.